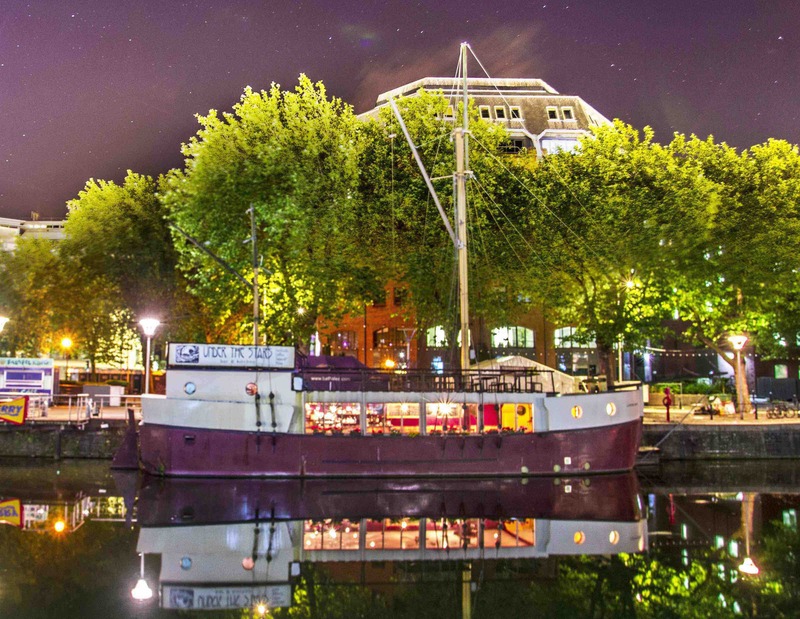 My husband and I booked a table months ago, to celebrate our joint birthday which was in 18 th April the venue on the boat was fantastic. . I had asked for a table by the window to see the waterside , response to my booking request was quick and efficient. Customer service was friendly and organised on arrival - we were not disappointed with our tapas food it was lovely . We chose 3 tapas each to share , portions were big and cost good value . We chose Grilled pardon peppers , lamb skewers in pesto, harissa chicken , Gambas in a lovely wine marinade ( large prawns) ,  marinated broccoli tomatoes with pine nuts , houmous and bread. Loved all the Food , especially the Gambas. Restaurant staff suggested the double chocolate cream egg brownie ( hot) with ice cream and this was the best brownie I have ever tasted. My husband was in his element as he loves Affogato ice cream pudding which had a espresso  coffee and a shot  of Disaronno liquer on the side. What made our night special was that the boat restaurant staff surprised us and Remembered our birthday and gave us the puddings free which was a lovely gesture . 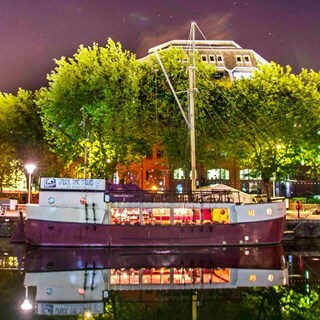 We can't wait to come back to this restaurant again, our daughter is coming to Bristol uni in Sept so this lovely " Under the Stars" boat restaurant/ bar will be a faviorate earring place for us . Thank you to the manager and staff for making our birthday meal a memorable one . Lovely place and great food, definitely will be going back. This place serves such amazing food and drink in a really cosy and charming setting. We have been to Under The Stars several times and have always had fantastic food. The deserts seemed a better standard than the mains via presentation and taste! We felt that the boat was on far more of an angle this time so we were sat on quiet a slope. There is always a lovely atmosphere however coming here for a catch up with family was difficult as it really was loud! You had to raise your voice to be heard and strain to hear the person sat opposite you. Booked for a party of 5. Food, drinks and service were all top notch and the atmosphere and surroundings are excellent. First visit but will return soon. Really lovely venue and good selection of food options. The food was nice but not 'outstanding'. The bar staff were happy to make me a Mocktail which was really nice (would be great if you had some on the menu). Very good restaurant, lovely atmosphere and the food was amazing. They were good with my nut allergy, it helps the menu has allergy info on. We will defo be back. Thank you! - place was dirty! Restaurant and toilets! Sticky floors and tables. Needs a deep clean! - Very cold! Need to get heaters in! We had a lovely food and nice wine in a lovely atmosphere. I had a party of 12. Everyone really enjoyed it and they all said they would come back again. I will organise another meal, or 2 and I am sure I will have a lot of interest.. The food was very good and the staff were great. Great all round. Great food, staff and setting. Thanks for a lovely meal. Really enjoyed my meal. I was a lone diner and was disappointed I wasn’t given an option to sit further away from people. It felt slightly awkward as I was sat next to the only two people in the restaurant at that time. Amazing dining experience. Can’t fault anything and looking forward to heading back! Love this place. So many nice tapas dishes. Surprised bread wasn’t included with the tapas and there wasn’t much bread with the balsamic & oil that we paid for. If the kitchen can only cope with 2 pizzas at a time this needs to be said at ordering as our party ordered 3 pizza and 1 was very late coming out, when the rest of us had nearly finished. Appreciated it being taken off the bill. Good choice of tapas but the chilli flakes on the lamb skewers overpowered the flavour of the lamb. Atmosphere is fab, love the candles, bunting, fairy lights, being on the river. Toilets good. Service a bit slow, we had to get attention to order another round of drinks. Plates cleared and dessert was offered a bit late. We had an excellent lunch at Under the Stars. Great venue, food was delicious, great selection of drinks on the menu and the service was brilliant. Would definitely return and definitely recommend!